Harmonia Macrocosmica Of 1660: The Finest Atlas Of The Heavens is a Taschen reprint of a celestial atlas by Andreas Cellarius. It's a perfect companion to Joan Blaeu's Atlas Maior, and these two atlases represent the pinnacle of the golden age of Dutch cartography. (It was originally published by Johannes Janssonius, Blaeu's chief competitor.) Michael Benson described Harmonia Macrocosmica as "one of the greatest celestial atlases" in his book Cosmigraphics. The reprint, a facsimile of the original 1660 Latin edition, features twenty-nine magnificent double-folio plates, with an introduction by Robert van Gent (a contributor to David Woodward's ongoing History Of Cartography project) and a concise bibliography. 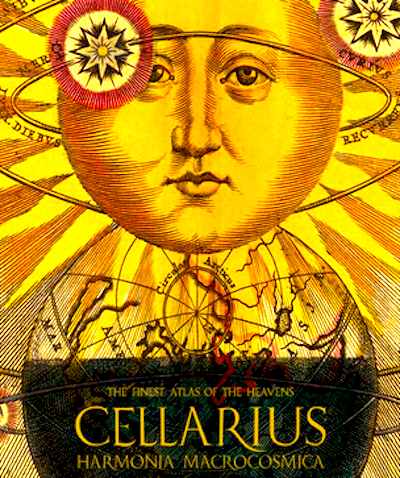 The introduction outlines the history of astronomy and uranography (celestial cartography), from geocentrism (the Ptolemaic system) to heliocentrism (the Copernican system), and the hybrid model of Tycho Brahe. 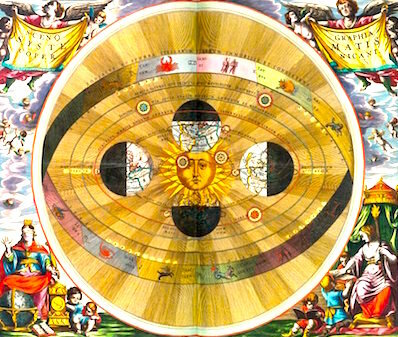 Most of Harmonia Macrocosmica's ornate Baroque plates illustrate the inaccurate Ptolemaic model, though Taschen's cover shows a detail from one of the few Copernican plates. Gent singles out the 'scenographia' plates, depicting the celestial and terrestrial hemispheres simultaneously, as "universally admired for the breathtaking beauty and originality of their design".